One of the largest snakes on earth, the Anaconda doesn’t have many natural predators, however as this video shows, a determined Jaguar can make a meal of him, but not without a battle. In a fight to the finish, this tiger takes on a crocodile and wins a battle that could easily have gone the other way. Not normally friends in the wild, these two, a leopard and tiger don’t seem to understand that they shouldn’t be friendly. The black widow spider gives a new meaning to the phrase forbidden love, with her habit of killing the mate just after the mating process. 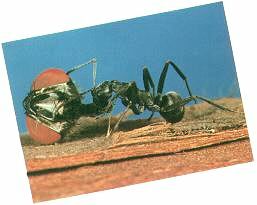 Swarming fire ants sometimes create vast problems, eating everything that lies in front of them, even stripping bones completely bare of flesh. A male lion, on the prowl and looking to kill the infants of his rival, gets a bit more than he bargained for when mum decides to protect her babies from his predation. Not for the squeamish, in this video, a new male to the pride will usually hunt down and kill the cubs of the other male, in order to bring the female into heat and make his own family. This one should probably not be viewed by those who aren’t prepared for it. Not for the faint hearted, in this video lions stalk and hunt down, then kill a hyena, merely, it seems for feuding, or for sport. Cheetahs and Hyenas don’t always see eye to eye, particularly when it comes to sharing a meal that the cheetahs see as their own. Two cheetahs think they’ve found an easy mark and a fast meal, until they are confronted by the mother of their intended meal, who has other ideas of her own. Animal kingdom or human, we all seem to share certain traits don’t we, among them, bodily functions like sneezing and colds. Some of these folks are truly in need of a diet, or at least a slimmming program of some variety. Not all of them are domestic animals, some are simply wild ones who have a apparently found a very good food source.